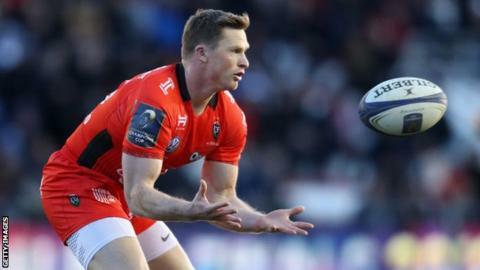 Chris Ashton has signed for Premiership club Sale Sharks following his early release by French side Toulon. The 31-year-old, who moved to France from Saracens for the 2017-18 season, broke the Top 14 try-scoring record with 24 tries in 23 appearances. He had two years left on his contract, but the French club announced his departure because of "important family problems". "This really feels like 'going home'," Wigan-born Ashton said on Tuesday. "I've always thought in the back of my mind that I'd return to the north [of England] to play rugby and I'm delighted to be joining Sale Sharks. "I'm not coming to rest on my laurels. I feel I've got a lot of rugby left in me and would like to make an impact and help to take the club to their winning ways of 2006." Ashton returns to the Premiership keen to resurrect his England career ahead of the 2019 World Cup, having been dropped from the national side before the 2015 edition. The winger, who has scored 19 tries in 39 appearances for England, last played for his country in 2014. "Chris is obviously a world-class signing," said Sale director of rugby Steve Diamond. "He wanted to return to this country to fulfil his potential with England again, and we thought that he'd fit in well here. Since 2012, the RFU have ruled that the England coach cannot select players based outside England barring "exceptional circumstances". In May, Ashton revealed his desire to play for England again, telling the Rugby Union Weekly podcast that he felt he could still thrive at international level, before scoring a hat-trick against his country for the Barbarians at Twickenham. Ashton was only one season into a three-year deal with Toulon, but has agreed compensation terms with the French side. "At the request of the player, Toulon have decided to release Chris Ashton from the remaining two years of his contract," a club statement said on Tuesday. "Ashton was no longer in a psychological condition to play in France and with Toulon due to important family problems."